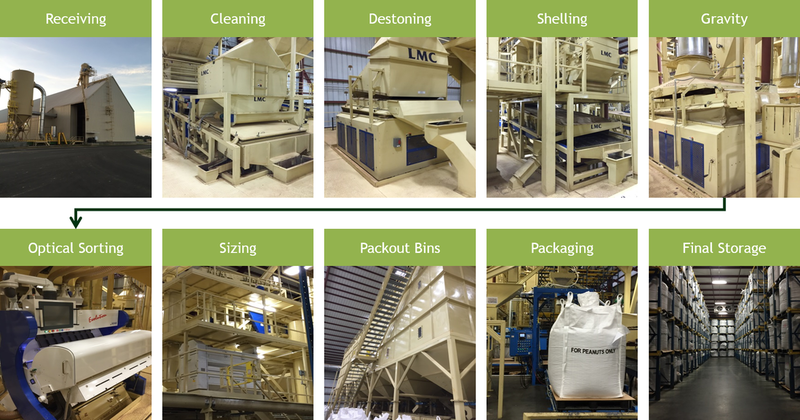 Our Shelling plant is a state-of-the-art-facility designed and built by Lewis M. Carter Manufacturing Company (LMC). The plant encompasses over 148,000 sq. feet and has a total shelling capacity of 300,000 tons of peanuts per year. Our plant is strategically located next to a main rail line with a newly built rail spur making it possible for us to ship our finished product by both railcar and truck. Our shelling facility is on the cutting edge of technology and offers new advantages in the peanut industry. Satake optical sorters were installed to provide color, size, and shape sorting technology. The Satake Evolution RGB functions much like the human eye, detecting color based on red, green, and blue wavelengths. With this technology, the slightest color variations can be identified and rejected. The model also has custom full-color RGB cameras that enable for the identification of foreign material of the same color. The installation of this system provides our company with an additional assurance on the quality of the product we are shipping to our customers.